Often people have a hard time figuring where to start when they plan to decorate the baby’s nursery. We asked experts in nursery design for tips to help with nursery decor. Here are the top ten tips that will go a long way in guiding you. It is a good idea to choose a room that is closer to the bedroom so that you don’t have to walk far at night. Ensure that a warm room has good ventilation and a cold room has adequate heating. If the windows of the room are letting in a lot of light, it can be a good idea to put black-out blinds or curtains to keep it dark, which will help the baby sleep at night. Is the style of your home contemporary, traditional, or something of the sort? You should make sure that the design of the nursery reflects the style and décor of the rest of your home. This will prevent the room from looking out of place, which can sometimes be tiring. Go online and look for ideas and piece the ones you love together to create a mood board. This will help you in picking up your colors, keeping the ideas focuses and pulling the theme together. You will view gorgeous nursery furniture and it can sometimes be tricky because you can find yourself going over the top. The furniture you choose should be child-friendly. Choose the single focus for the room when starting out and keep it simple. The focus can be artwork or a piece of furniture. Choosing a neutral background and using age-appropriate accessories can sometimes mean not having to redecorate after a couple of years. Always choose calm and nurturing colors. When they get older, kids start having their own ideas about their bedroom, so use this time to choose something that will make you feel relaxed. Mums need calm more than anything because of the demands of a newborn. Here is a good blog on how the colours impact on your child. 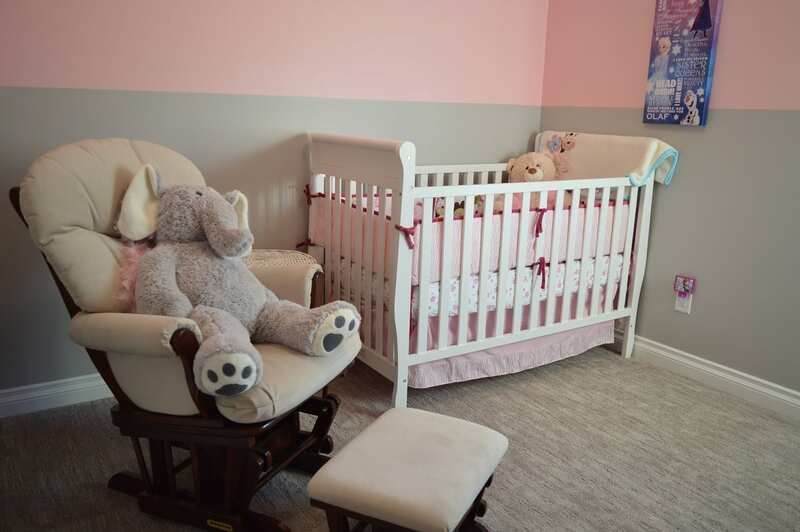 Consider how long the nursery décor will last the baby. Wallpaper with cartoon characters can be easily changed in a couple of years if the child starts to get interested in something else or think it is babyish. Wall stickers are not expensive and can be the perfect alternative since they can be easily taken down as the child gets older. If you’re being put off by putting them up, it’s actually quite easy, you can see how to add decals to the wall here. When buying a cot, make sure it meets BS EN 716-2:2008 because all new cots in the UK must meet this safety standard. It requires the cot to be deep enough, does not have steps or cut-outs, and that the bards are the correct distance apart. Position the cot away from heaters, windows, lamps, cords, and wall decorations. You should also move furniture that the child can clamber onto away from the cot. This sounds a little odd, but you need to choose the furniture before you can start the process of decorating. People always prefer to start by choosing the color first, but matching paint, fabric, and wallpapers to the furniture pieces will be cheaper. The hardest part of designing the nursery will be ensuring it is practical and easy to use. You will need to consider the size of the room, how it is going to be used, and how long it will be a nursery before you design it to fit your needs. The fact that a piece of furniture or accessory is not nursery-specific does not mean you cannot use it. This can be said about the wallpaper, stickers, and fabrics. Go with items and colors you love. Take a trip to a local DIY store and check out the paint aisles – you might be surprised to find a great mix of colors that you wouldn’t have been able to think about. You need to keep in mind that you should not paint when pregnant. Get started today.